Nice Threads - Good & Sturdy Vintage opens doors on Water St.
Good & Sturdy Vintage opens doors on Water St. IF YOU’VE BEEN SEARCHING FOR THE REAL McCOY ... THEY’VE GOT ONE. 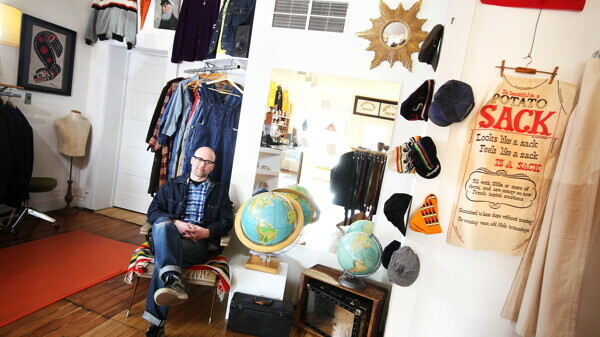 Jon Shemick’s Good & Sturdy Vintage shop specializes in men’s clothing, artwork and glassware. As an aging hipster in what is factually considered the mecca of culture in Western Wisconsin, I am for the most part very happy with my commerce selections. Whether I need a fair trade latte, ironic tattoo or a Violent Femmes record I have a places to meet those needs while simultaneously being able to tell everyone that I made the choice to shop local. However, there was one thing missing in my commerce cornucopia and that is a place where I can get righteous vintage clothing. Don’t get me wrong we have some great resale shops here which I frequent, but those stores aren’t specifically catered to vintage clothing lovers so they don’t have the precision and knowledge that a true collector brings to the table. Luckily for Eau Claire, Jon Shemick brings that knowledge to the table, or store in this instance, at his new Water Street shop, Good & Sturdy Vintage. In the store Shemick not only sells some great vintage men’s clothing, he also carries artwork and glassware, specifically, awesome Tiki mugs which a certain Volume One contributor might want for Christmas. While I was in Good & Sturdy Vintage I noticed that there was a running theme to all the merchandise but I couldn’t quite articulate it. Having a consistent aesthetic in a store such as Shemick’s doesn’t happen quickly. Schemick has spent the last fifteen years combing thrift stores, garage sales and estate sales to find his merchandise. In his pursuit of great vintage clothing and housewares he has even bought whole estates. From looking around the store it is obvious that Shemick really appreciates everything in the store and sees its importance and really wants customers to find things that are relevant and have a story. Which is the key to that aesthetic question, I was trying to unravel while I was in Good & Sturdy Vintage. Shemick says that he is also interested in buying vintage clothing from the community. Though he says that with his focus for what he wants for the store and himself he is limited in what he buys. Yet, he doesn’t want that to deter anyone from people bringing anything into the store because he is always amazed at single pieces of clothing in large piles that have the vintage aesthetic and authenticity he is constantly searching for. And, in the end, it’s that drive towards aesthetic that makes Good & Sturdy an interesting place to check out again and again. As stuff is bought, new stuff deliberately takes its place. Which makes the store consistently a new hip place to look around. 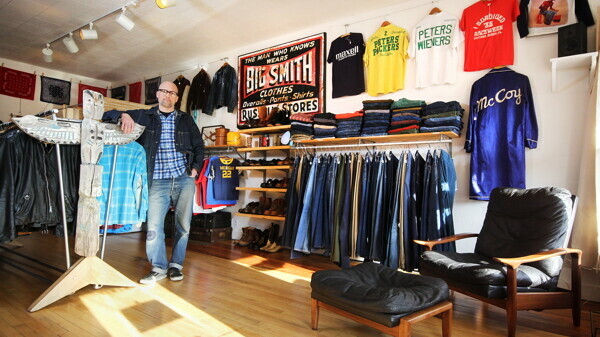 Good and Sturdy Vintage is located at 218 Water St. in Eau Claire and is open Tues.-Sun, 11am-6pm.